The nurse is assessing a client newly diagnosed with initial-stage chronic glomerulonephritis. Which of the following findings should the nurse expect to see? Select all that apply. Destruction, inflammation, and sclerosis of the glomeruli of both kidneys occur. The inflammation of the glomeruli results from an antigen-antibody reaction produced from an infection or autoimmune process elsewhere in the body. Loss of kidney function occurs. Acute glomerulonephritis occurs 5 to 21 days after a streptococcal infection. 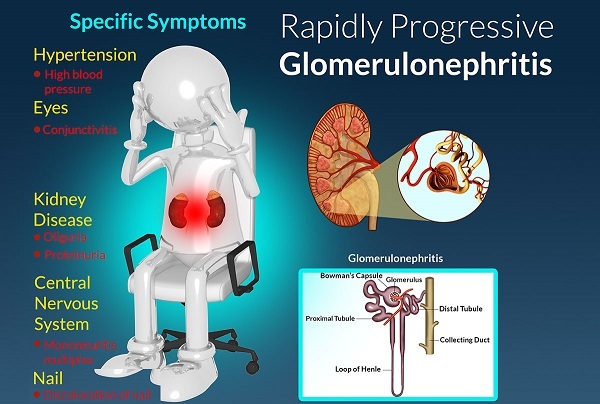 Chronic glomerulonephritis can occur after the acute phase or slowly over time.